La hija del Yeti, el monstruo de las nieves: Abbey Bominable ¡Congeladamente preciosa! Monster High - Abbey Bominable. Las Monter High, son las hijas de los monstruos más legendarios de la historia y también las chicas más fashion del Instituto Monster High, con su ropa y accesorios de última moda. Cada personaje va acompañado de su diario y su fiel mascota. Monster High es la historia de seis adolescentes de moda, que se enfrentan entre sí y con gran sentido del humor. Abbey es la nueva estudiante de intercambio de Monster High y viene de las montañas, donde no hay teléfonos móviles y se habla el yético. Le cuesta encajar en el instituto y todavía no habla bien el idioma monstruoso, por lo que todavía no ha hecho amigos. 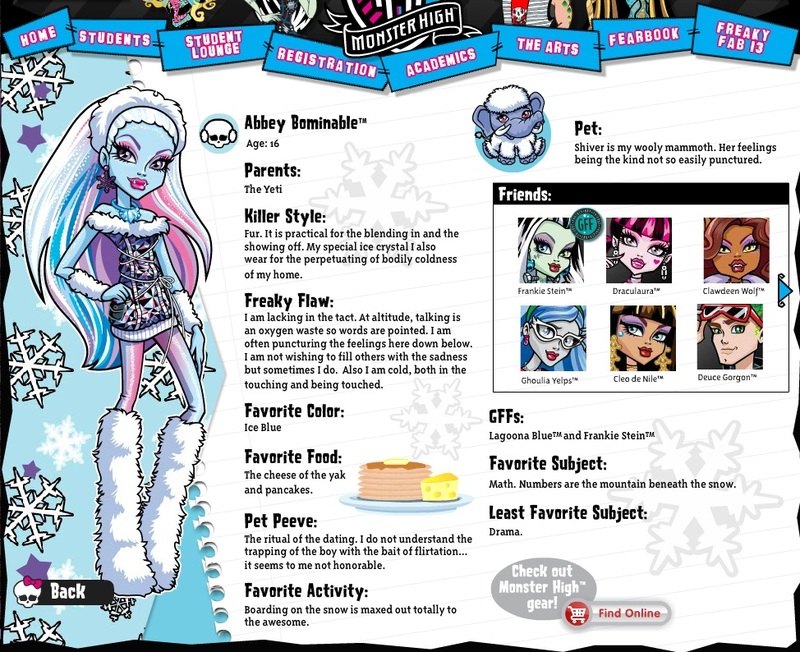 Su enorme fuerza y el dominio del snowboard son otras de sus señas de identidad, que le ayudarán a integrarse en Monster High. Monster High Abbey Bominable Doll: The ghouls from Monster High are freakishly fabulous. The kids from Monster High are the coolest ghouls in school with their fashions, accessories and scary cute pets. And now there is a new ghoul at Monster High, Abbey Bominable who is making a scary good impression! Abbey Bominable is the daughter of the Yeti and an exchange student from up north. Abbey would be lost in the snow without her best friend and pet, Shiver a sweet and loyal Wooly Mammoth. Abbey Bominable doll is fully articulated so she can be posed in many different ways and includes pet Wooly Mammoth Shiver, doll stand, brush, diary and accessory. Otras MONSTER HIGH en el blog!